Show off beautiful arrangements of flowers and greenery in sustainable style with the Beacon Hill Series planters. 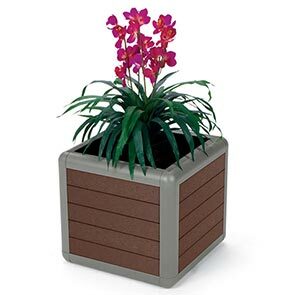 The 25 gallon square planters are comprised of 1" x 4" horizontal or vertically placed recycled plastic lumber planks, secured by an powder-coated aluminum frame. Analogous to the look of wood, the 95% recycled plastic lumber slats are impervious to moisture and won't fall prey to rot or corrosion. Built ready for action, the resilient planters include adjustable rubber feet and a reusable plastic liner. The liner is made of high-density polyethylene with predrilled holes for excess water drainage.